This week marks the 10th anniversary of the creation of Go. The Go project counts its birthday as November 10, 2009, the day it launched as open source, originally on code.google.com before migrating to GitHub a few years later. But for now let's date the language from its conception, two years earlier, which allows us to reach further back, take a longer view, and witness some of the earlier events in its history. From: Ian Lance Taylor Date: Sat, Jun 7, 2008 at 7:06 PM To: Robert Griesemer, Rob Pike, Ken Thompson One of my office-mates pointed me at http://.../go_lang.html . It seems like an interesting language, and I threw together a gcc frontend for it. It's missing a lot of features, of course, but it does compile the prime sieve code on the web page. The shocking yet delightful arrival of an ally (Ian) and a second compiler (gccgo) was not only encouraging, it was enabling. 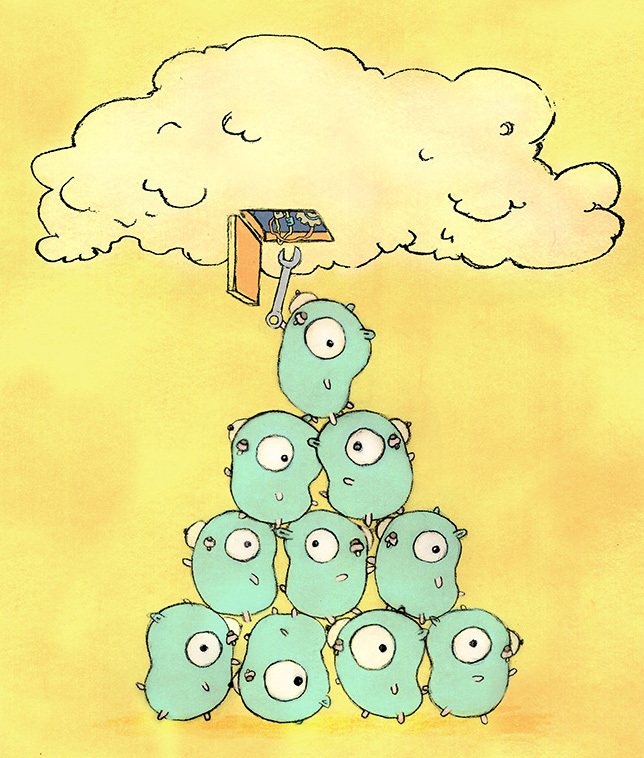 Having a second implementation of the language was vital to the process of locking down the specification and libraries, helping guarantee the high portability that is part of Go's promise. Even though his office was not far away, none of us had even met Ian before that mail, but he has been a central player in the design and implementation of the language and its tools ever since. Russ Cox joined the nascent Go team in 2008 as well, bringing his own bag of tricks. Russ discovered—that's the right word—that the generality of Go's methods meant that a function could have methods, leading to the http.HandlerFunc idea, which was an unexpected result for all of us. Russ promoted more general ideas too, like the the io.Reader and io.Writer interfaces, which informed the structure of all the I/O libraries. Jini Kim, who was our product manager for the launch, recruited the security expert Adam Langley to help us get Go out the door. Adam did a lot of things for us that are not widely known, including creating the original golang.org web page and the build dashboard, but of course his biggest contribution was in the cryptographic libraries. At first, they seemed disproportionate in both size and complexity, at least to some of us, but they enabled so much important networking and security software later that they become a crucial part of the Go story. Network infrastructure companies like Cloudflare lean heavily on Adam's work in Go, and the internet is better for it. So is Go, and we thank him. In fact a number of companies started to play with Go early on, particularly startups. Some of those became powerhouses of cloud computing. One such startup, now called Docker, used Go and catalyzed the container industry for computing, which then led to other efforts such as Kubernetes. Today it's fair to say that Go is the language of containers, another completely unexpected result. Go's role in cloud computing is even bigger, though. In March of 2014 Donnie Berkholz, writing for RedMonk, claimed that Go was "the emerging language of cloud infrastructure". Around the same time, Derek Collison of Apcera stated that Go was already the language of the cloud. That might not have been quite true then, but as the word "emerging" used by Berkholz implied, it was becoming true. Today, Go is the language of the cloud, and to think that a language only ten years old has come to dominate such a large and growing industry is the kind of success one can only dream of. And if you think "dominate" is too strong a word, take a look at the internet inside China. For a while, the huge usage of Go in China signaled to us by the Google trends graph seemed some sort of mistake, but as anyone who has been to the Go conferences in China can attest, the measurements are real. Go is huge in China. In short, ten years of travel with the language have brought us past many milestones. The most astonishing is at our current position: a conservative estimate suggests there are at least half a million Go programmers. When the mail message naming Go was sent, the idea of there being half a million gophers would have sounded preposterous. Yet here we are, and the number continues to grow. Speaking of gophers, it's been fun to watch how Renee French's idea for a mascot, the Go gopher, became not only a much loved creation but also a symbol for Go programmers everywhere. 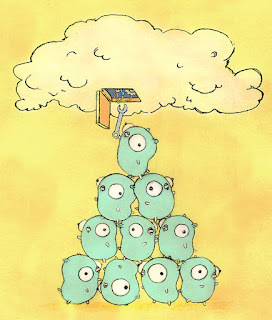 Many of the biggest Go conferences are called GopherCons as they gather together gophers from all over the world. Gopher conferences are taking off. The first one was only three years ago, yet today there are many, all around the world, plus countless smaller local "meetups". On any given day, there is more likely than not a group of gophers meeting somewhere in the world to share ideas. Looking back over ten years of Go design and development, it is astounding to reflect on the growth of the Go community. The number of conferences and meetups, the long and ever-increasing list of contributors to the Go project, the profusion of open source repositories hosting Go code, the number of companies using Go, some exclusively: these are all astonishing to contemplate. For the three of us, Robert, Rob, and Ken, who just wanted to make our programming lives easier, it's incredibly gratifying to witness what our work has started. What will the next ten years bring? I've been trying on and off to find a nice way to deal with setting options in a Go package I am writing. Options on a type, that is. The package is intricate and there will probably end up being dozens of options. There are many ways to do this kind of thing, but I wanted one that felt nice to use, didn't require too much API (or at least not too much for the user to absorb), and could grow as needed without bloat. I've tried most of the obvious ways: option structs, lots of methods, variant constructors, and more, and found them all unsatisfactory. After a bunch of trial versions over the past year or so, and a lot of conversations with other Gophers making suggestions, I've finally found one I like. You might like it too. Or you might not, but either way it does show an interesting use of self-referential functions. I hope I have your attention now. Let's start with a simple version. We'll refine it to get to the final version. Here is the text of the talk I gave at the Go SF meeting in June, 2012. This is a personal talk. I do not speak for anyone else on the Go team here, although I want to acknowledge right up front that the team is what made and continues to make Go happen. I'd also like to thank the Go SF organizers for giving me the opportunity to talk to you. I was asked a few weeks ago, "What was the biggest surprise you encountered rolling out Go?" I knew the answer instantly: Although we expected C++ programmers to see Go as an alternative, instead most Go programmers come from languages like Python and Ruby. Very few come from C++. We—Ken, Robert and myself—were C++ programmers when we designed a new language to solve the problems that we thought needed to be solved for the kind of software we wrote. It seems almost paradoxical that other C++ programmers don't seem to care. Whenever I see code that asks what the native byte order is, it's almost certain the code is either wrong or misguided. And if the native byte order really does matter to the execution of the program, it's almost certain to be dealing with some external software that is either wrong or misguided. If your code contains #ifdef BIG_ENDIAN or the equivalent, you need to unlearn about byte order. The byte order of the computer doesn't matter much at all except to compiler writers and the like, who fuss over allocation of bytes of memory mapped to register pieces. Chances are you're not a compiler writer, so the computer's byte order shouldn't matter to you one bit.